Designed by the distinguished Edinburgh architect Hippolyte Blanc, 1894 – 95, Gothic-style and red sandstone with crenellated octagonal tower, on corner site. Stained glass by Guthrie and Wells, and Abbey Studio. Halls at rear in grey sandstone, 1883, with circular stained glass window. 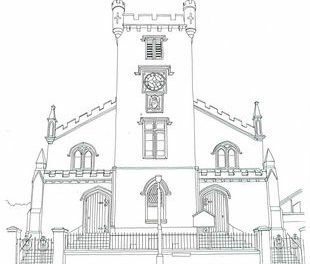 Church and halls have been renovated recently, part of an ongoing programme, with a heritage display highlighting the history of the area and the life of the church in the community.